For me, eating raw isn’t a rigid, black and white rule based regimen/ programme; strictly to be adhered to or else! I'm pretty relaxed about it really. Pretty chilled! 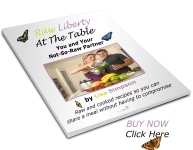 So what does 'raw' mean to me? It means eating lots and lots of fresh (organic as far as possible) fruit and vegetables, nuts, seeds and more recently for me, superfoods. It means eating as few pre-prepared processed convenience foods (I use the term ‘food’ very loosely here) as possible. making mistakes, but learning from them.... If I eat that pizza I’m gonna feel sick, if I drink that bottle of wine, I’m gonna have a hangover! It’s also about remembering this, and being aware of this when you make your food/drink choices. It most definitely means loving what you eat, and loving how it makes you feel. That's a DEAD CERT! It means learning to listen to your body, and nourishing it in a way in which it thrives, and makes you feel alive rather than heavy and sluggish. It means having a healthy attitude to life and food. Enjoying what you eat can be more healthy than stressing about what you think you should be eating; whether that cashew nut is actually, strictly, technically ‘raw’ or not.... agh! It most definitely means loving yourself (something we all need to do more of....NOTE TO SELF! )looking after your body, after all it’s the only one you have! Remember: You are so worth it! An exclusive group....hell anyone can eat an apple! 100% or fail...don't get me started on percentages. I am open and accepting of views and opinions of others, after all we are all different, how can we possibly know what’s going on for someone else, what’s right for someone else? I am non judgemental, we are all different. I am comfortable with how I choose to eat. It's not a problem to me, don't make it your problem.